Raritan RAV-IPDS-ENC is a Transmitter (Encoder) for the Raritan AV-Over-IP System (RAV-IP). Please note, this unit must be used in conjunction with at least one RAV-IP Receiver. Raritan's RAV-IP the most flexible AV-over-IP system with Cat5 and fiber connections for both AV and computer devices. 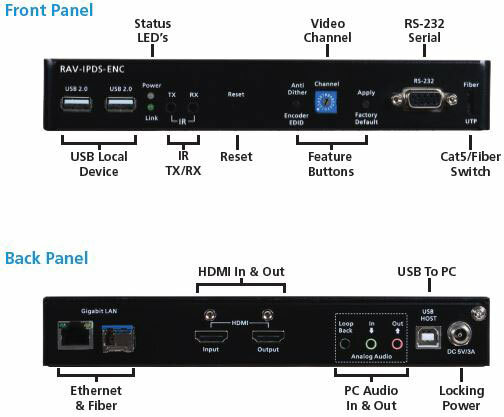 The RAV-IP system enables a wide range of applications through a few basic, yet powerful configurations: (1) Point-to-point extension to extend an AV device or computer to another location, (2) Single-channel video distribution to multiple destinations, and (3) Multi-channel switching of multiple video sources to multiple destinations.